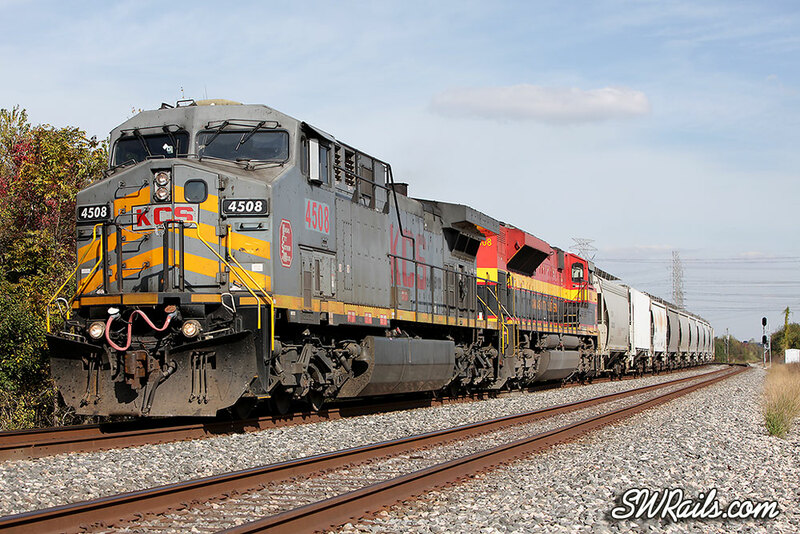 On paper, it was supposed to be an epic chase – two NS Heritage locomotives leading a UP freight under almost perfect weather and lighting conditions. However, as you sports fans know, the game isn’t played on paper. Word was that UP’s MEWEY-21 (Manifest Englewood -East Yard) would have 4 NS motors, the first two being NS heritage units. A trace showed the train was by Bringhurst Avenue (just west of Englewood) at 11:08 AM. 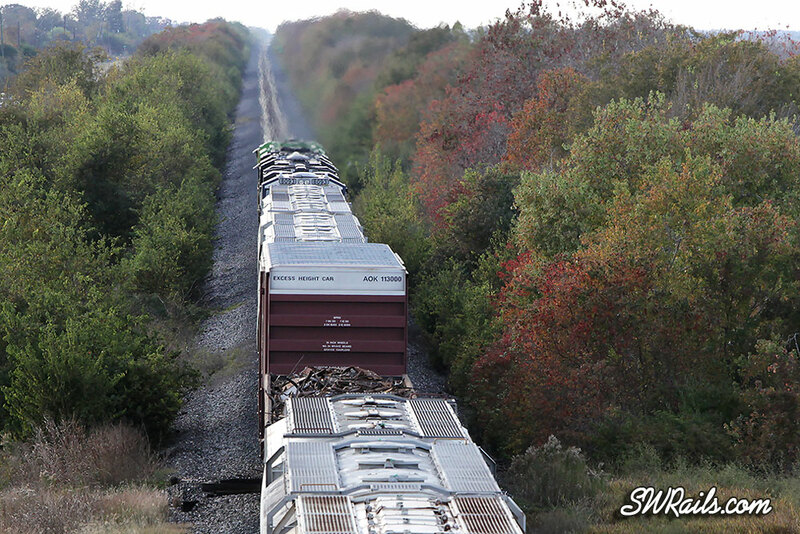 Normally that would put the train into my neck of the woods shortly after noon, so I had all of these visions of a 3-4 hour photographic pursuit of the train as it traveled toward San Antonio. We got out of the house, took care of a few errands, and headed toward West Junction where I hoped to get my first shots of the train. 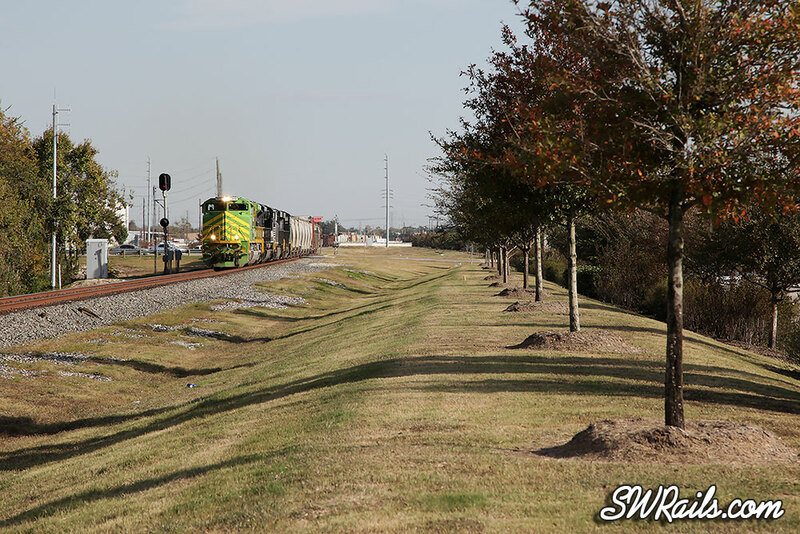 En route, I heard the DS tell the MOW foreman at Heacker that UP 8408 would be the next train through their Form B . I set up for it between switches at Missouri City, catching the MEWEG-21 (Manifest Englewood – Eagle Pass) at 11:27 AM. I fully expected the MEWEY to be right behind the MEWEG, so I went straight to West Junction to set up for it. Due to the Form B in effect, I knew I’d get a 5-10 minute heads-up to the arrival of the MEWEY, so I took a few shots of the double-track project around Heacker to pass the time. Once I was done with that, I stopped by a convenience store to load up on snacks in anticipation of the long chase of the MEWEY. And the wait began. After an hour had gone by with no sign of my quarry or anything else , I did another trace of NS 1072, the lead unit of the MEWEY. The trace result was the same, by Bringhurst at 11:08 AM. Hmmmm? What to do? Do I sit tight, or do I drive the 25 miles to Houston to find the train? I decided against driving to Houston, feeling that there was a good chance the train would get by me. I spent the next 45 minutes taking more pictures of the double-tracking project. Still no train, so time for another trace. “Passing Tower 26 at 12:33 PM”. The train had finally moved, but only two miles in 90 minutes! Maybe I should have gone to Houston after all! At least the train is headed my way, right? Well, kind of. Turns out there’s a short-time KCSM train in front of the MEWEY. The plan is to patch the KCSM at Post Oak, but the relief crew has been delayed. Wonderful. Actually, better than wonderful because not only is it getting late, but there’s a bunch of clouds moving in from the north. KCSM 4508 announces his imminent arrival by calling Foreman Huerta for clearance through the Form B, so I set up just west of West Junction, catching it at 1:46 PM. 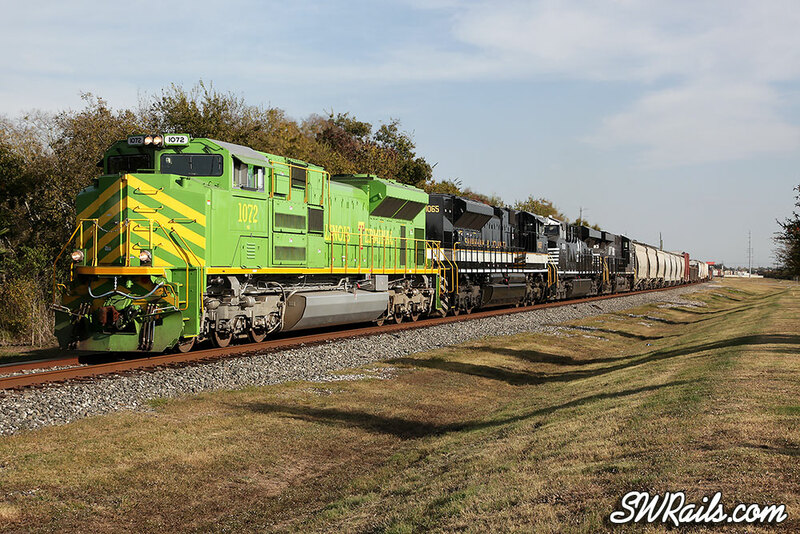 Knowing that the KCSM wasn’t going anywhere soon and that the DS had some eastbound traffic to run, I had no choice but to drive in to Houston. Hopefully the MEWEY was stopped somewhere shootable. 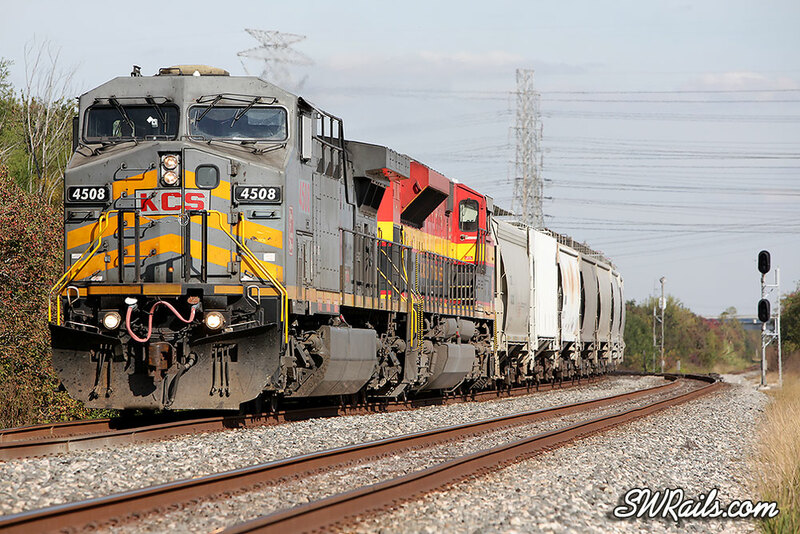 A quick 10 mile drive shot down that hope, as I found the train stopped well north of the San Felipe grade crossing, photographically inaccessible. Oh well, nothing to do but drive back. At this point it seemed that I’d get no shot of the MEWEY before sunset because the KCSM was still at Post Oak getting re-crewed, and nothing was moving west until 2 eastbounds got by. As I was cursing my luck, the dispatcher called an audible. He decided to hold the eastbounds at Sugar Land and Harlem and would be running the MEWEY around the KCSM at Post Oak. I wonder if the decision was made because the MEWEY crew had been on duty over 5 hours by this point, had yet to travel 20 miles, and still had nearly 200 miles to cover before the crew expired. No matter, at least I stood to get a few shots of the elusive beast before dark. By this point, the light between West Junction and Missouri City was too nosy. 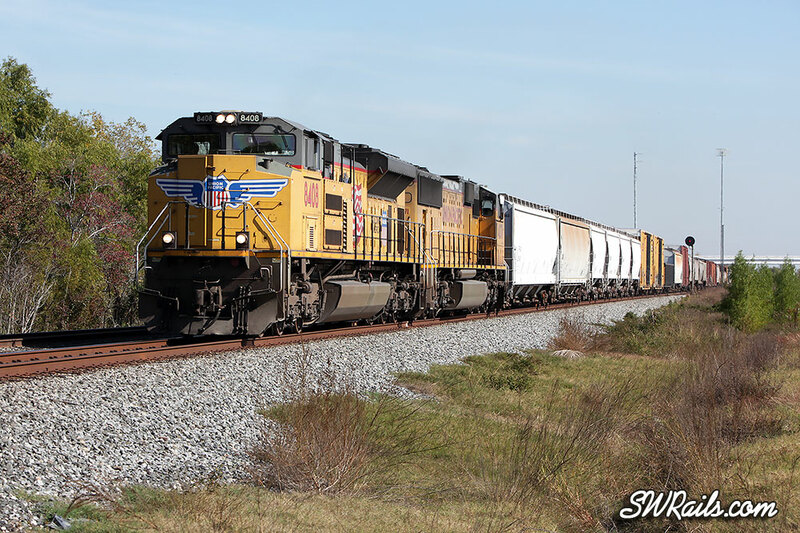 I went to Stafford, setting up just west of the intermediate signal at MP 20.6. A 10 second pause ensued before the conductor responded. As the train came into range at 3:03 PM, the sun dove into some thick cirrus, but a quick adjustment to ISO 800 saved the day. I never expected to see one, much less two NS Heritage units to come through here. 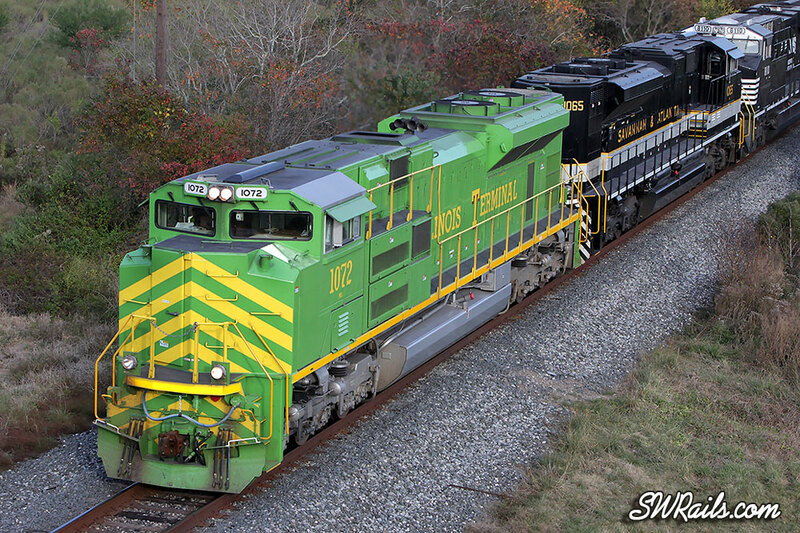 Lead unit NS 1072 in Illinois Terminal colors, followed by NS 1065 in Savannah & Atlanta colors make the long wait worthwhile. 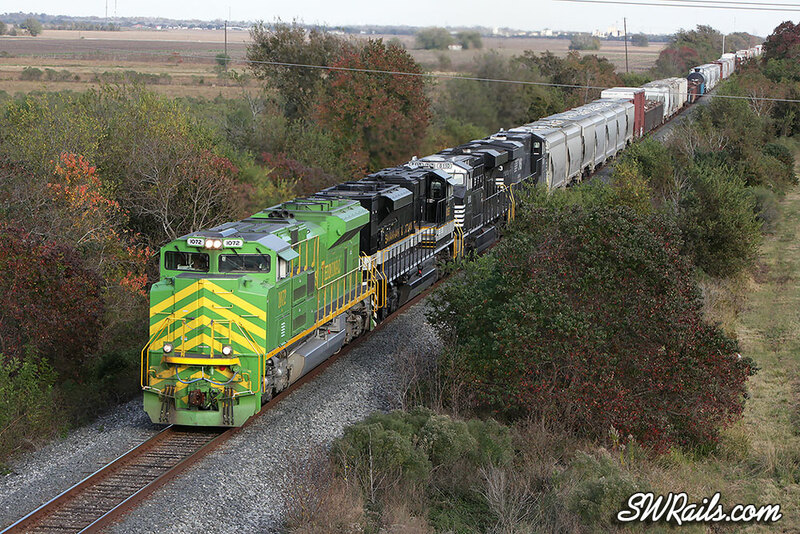 Hoping to get a shot in better light, and to double the productivity of the 3 1/2 hour wait, I drove to the Spur 10 overpass at the west end of Rosenberg. The clouds have really done a number on the light, but what can you really do? I was half-tempted to continue westward in the hope of getting better light, but I thought better of it. 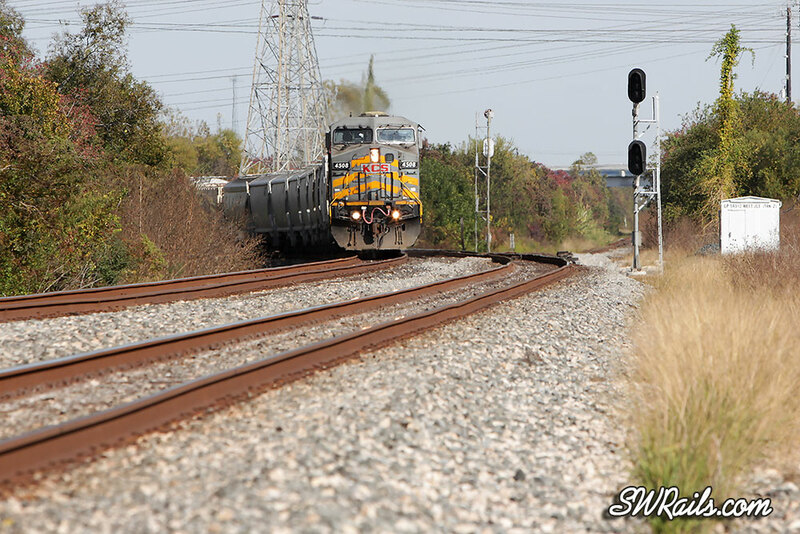 I contented myself with this going-away shot of the train as it heads west. 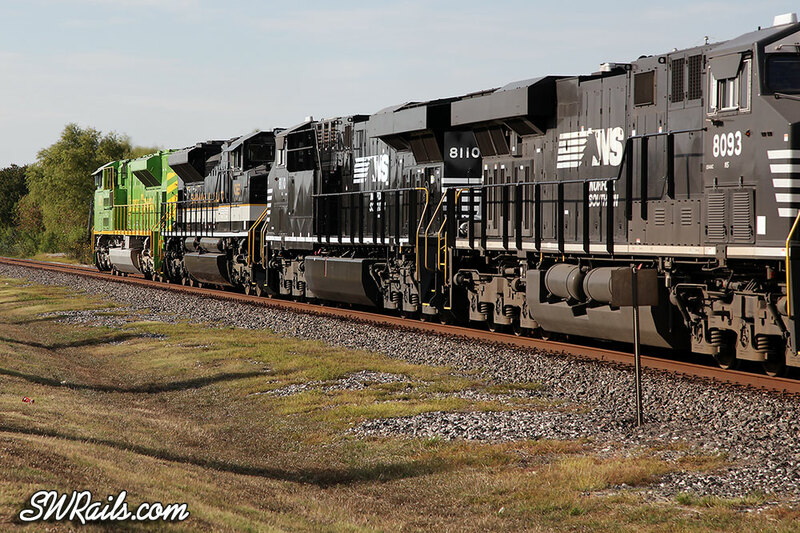 It’s my understanding that the NS 1072 and 1065 are en route for emissions testing in San Antonio. Hopefully they’ll return to the NS via the Glidden sub to where I might get another bite at this colorful apple. Some great photos. Like the part about the DS and crew talking about the locomotives.